Window Tinting„ San-Ai Corporation, U.S.A.
for your Home, Business or Auto. RIVEX film keeps glass intact and in place when shattered, preventing the dangerous effect of glass scattering throughout the passenger compartment during breakage. RIVEX film is available in varying degrees of sun light reducing levels. From clear film, with no alteration in the OEM glass color, to "black-out film" for maximum light reduction and privacy. RIVEX film is an effective and economical barrier to eliminate unwanted heat buildup within the passenger compartment of vehicles. RIVEX film prevents the damaging effects of various types of solar radiation and the destructive effect upon vehicle interior components over many years of the vehicles life. Heat Shielding: XCL and IRCCL are new types of clear heat cutting films, using ceramic particles to block infrared radiation. By applying to your glass surfaces, it is now possible to reduce unpleasant heat buildup near your windows. Reduce Reflection: RIVEX does not have a metallic shine of reflection, unlike inferior imitations. By reducing the dazzling effect of reflection from the outside, vision is much clearer. As a result, the natural grey color maintains the original natural impression of the glass. Corrosion Resistance: Because of the ceramic particles, special heat cutting properties are maintained without reduction for many years. Wireless Phone Interference: The RIVEX film has no electromagnetic wave shield characteristics like most inferior films, and has little if any effect upon mobile phone usage inside of the vehicle. 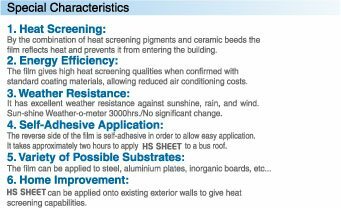 XCL Film Available: XCL is an additional type of film from RIVEX which cuts immediate vicinity infrared radiation. 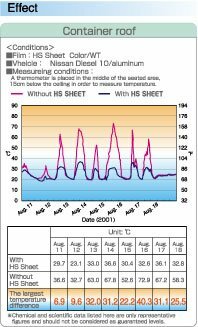 (See optical performance chart below) Without reducing visible light transmittance, IR reduction is able to reduce heat near windows. Economically Priced: XCL and IRCCL window films from RIVEX offer the highest quality yet are equally affordable and reasonably priced!